Philadelphia's great tradition of lightweight boxers almost rivals its middleweight output. South Philly's Mike Evans was part of a fine crop of 135-pounders that bloomed in the 1930s and 1940s. He was a tall, rangy boxer who faced many top-notch fighters. He more than held his own, compiling a 37-7-1 (6 KO) career record. Evans beat Eddie Cool, Tommy Spiegel (twice), Tommy Cross (twice), Honey Mellody, and won two of his three bouts with Luther "Slugger" White. However, Evans is probably best know for his two battles with uptown rival Bob Montgomery. In their first bout, Montgomery took a very close 10-round decision in a contest for the PA Lightweight Championship. A month later, Montgomery stopped Evans with three knockdowns in the first round. The only other man to halt Evans was Sugar Ray Robinson. 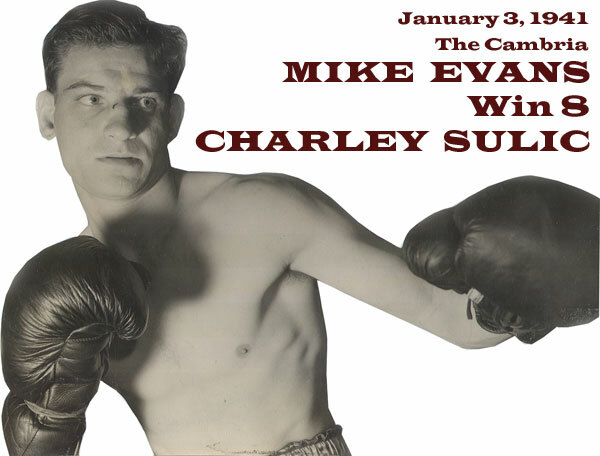 On this day in 1941, Mike Evans won a decision over Charley Sulic at the legendary Cambria Athletic Club on Kensington Ave & Somerset St in the Kensington section of Philadelphia.